President Barack Obama and Vice President Joe Biden are the most recent example of an American political bromance. Politicians have alliances and rivalries in their own political parties, across the aisle, and with other leaders across the world. But some take their allegiance to a different level. A select few enter the realm of bromance. From rivals to best buddies, here are five of the greatest political bromances that shaped US history. Presidents John Adams and Thomas Jefferson weren't always friends. Adams and Jefferson were the original American bromance. But the two men were also political rivals from very different backgrounds. Adams was a Federalist from Massachusetts, while Jefferson was an Anti-Federalist from Virginia. The two Founding Fathers, who would both serve as president, were pen pals and frequently wrote letters to each other over the years. After George Washington stepped down after his second term, the two ran against each other for the presidency. Even though Adams won that race, the two men eventually put their differences aside. Adams once wrote to Jefferson: "intimate Correspondence with you ... is one of the most agreeable Events in my Life." And on July 4, 1826 — which happened to be the 50th anniversary of the signing of the Declaration of Independence — Adams and Jefferson both died within hours of each other. Sen. Edward Kennedy, D-Mass., jokingly holds the Profile in Courage award lantern as if he intends to keep it, as co-winner Sen. John McCain, R-Ariz., looks on during ceremonies at the John F. Kennedy Library in Boston on May 24, 1999. Two senators who put party politics aside and reached across the aisle to work on legislation were Arizona Republican John McCain and Massachusetts Democrat Ted Kennedy. The two men worked closely together on several issues and pieces of legislation, including immigration reform. In his latest memoir, McCain said Kennedy "gave value no other senator had" when crafting legislation because of his outsize role in the Democratic party and because he was respected by all in the Senate. When Kennedy passed away in 2009, McCain gave a heartfelt eulogy at his funeral. "Ted and I shared the sentiment that a fight not joined was a fight not enjoyed," McCain said. McCain is now suffering from the same form of brain cancer as his former Senate colleague. After receiving the cancer diagnosis, McCain told CBS's "60 Minutes" that he still thinks about Kennedy a lot. The two Supreme Court justices were on opposite sides of the political spectrum, but the closest of friends. Two Supreme Court justices with very different ideologies were actually two of the closest on the highest court in the United States. Even though liberal justice Ruth Bader Ginsburg is not a "bro", she and the late conservative Justice Antonin Scalia formed a tight bond during their time on the court together despite agreeing on very few issues. "We were best buddies," Ginsburg wrote after Scalia passed away in 2016. 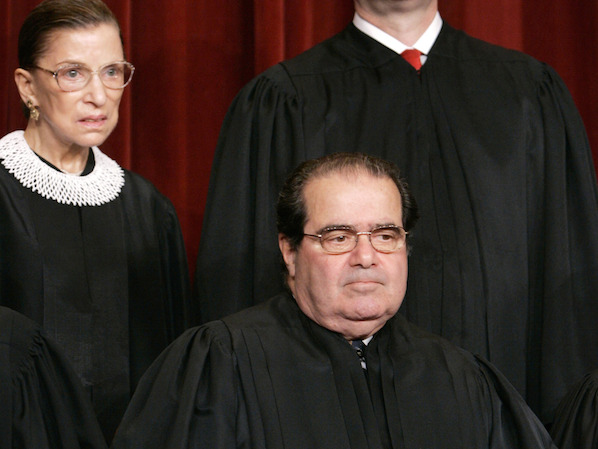 Both justices enjoyed opera, and Ginsburg has even said Scalia made her better as a justice. The two celebrated New Years and vacationed together every year with their spouses, too. Ginsburg recently said that she misses Scalia very much. The two presidents ran against each other representing opposing parties, but found friendship later in life. In 1992, Bill Clinton brought George H.W. Bush's time in the White House to a close after defeating him in the presidential election. 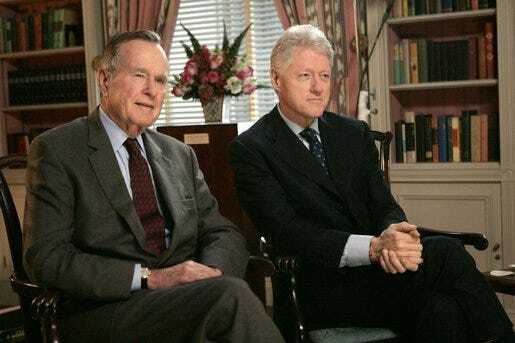 But the two men did not let the bitter race get in the way of establishing a close friendship, as Clinton would often seek out Bush's advice. Because of their close relationship, Barbara Bush once called Clinton "the black sheep of their family" while George W. Bush has called him "a brother from another mother." Bush 41 once said of Clinton, "You cannot get mad at the guy. I admit to wondering why he can't stay on time, but when I see him interacting with folks my wonder turns to understanding, with a dollop of angst thrown in." In a recent visit Clinton made to the Bush's vacation home in Maine, Bush revealed he had a pair of socks with Clinton's image on them. The president and his vice president were two of the closest in recent memory. It is hard to find a more famous bromance than the one between former President Barack Obama and former Vice President Biden. After competing for the Democratic nomination in 2008, Obama chose Biden to join him on the ticket as his vice president. From runs and walks around the White House to laughing over sharing meals and playing golf, the two were constantly seen together over their eight years in office. They even made friendship bracelets for each other to wear. Before leaving office, Obama delivered the eulogy at the funeral of Biden's son, Beau. He also presented Biden with the Presidential Medal of Freedom in a surprise ceremony. When the Bidens' planned to sell their house in order to help their son's family during his illness, Obama offered to cover the mortgage and give Biden the money. Former first lady Michelle Obama once said that her husband and Biden "really love one another." After leaving office, Obama said he "gained a brother" in Biden. "I don't like him, I love him," Biden said of Obama.